The fundamental and permanent properties of substance, so-called by logicians in contradistinction to accidents, which are modifications representing circumstantial properties only. Aristotle makes the distinction between "fundamental being" (τὰ ἐν τῆ οὐσία ὄντα) and its fundamental properties (τὰ συμβεβηκότα; "Metaphysics," iv. 30, 1025a, 30; and "De Animalium Partibus," i. 3, 643a, 27). Similarly the Arabian-Jewish philosophers discriminate between , "attribute," and , "accident"; and the typical defenders of the Attributes, the Sifatiya, are called by these philosophers , "accepters of attributes." The theory of Attributes was always an important problem of scholasticism, because of its intimate connection with the Christian doctrine of the Trinity. It cameinto prominence with Saadia's work, "Emunot we-Deot" (ii. 5, 53), in which the doctrine of Attributes is employed directly against the dogma of the Trinity. Saadia, who denies the positive attributes of God, with the exception of existence, unity, power, and wisdom, places the following alternative before Christian Trinitarianism: "God is either corporeal or incorporeal. If He be considered corporeal, positive attributes would indeed be possible, but then the idea of God would be open to the grossest anthropomorphism of the ignorant masses. If, on the other hand, God be considered incorporeal, He can possess no attributes (positive properties), for with the possession of attributes differences in God must be admitted, and differences can be predicated of that alone which is corporeal, not of that which is incorporeal." From this comparatively clear statement of the problem of Attributes it is apparent that it touches the very core of scholasticism. 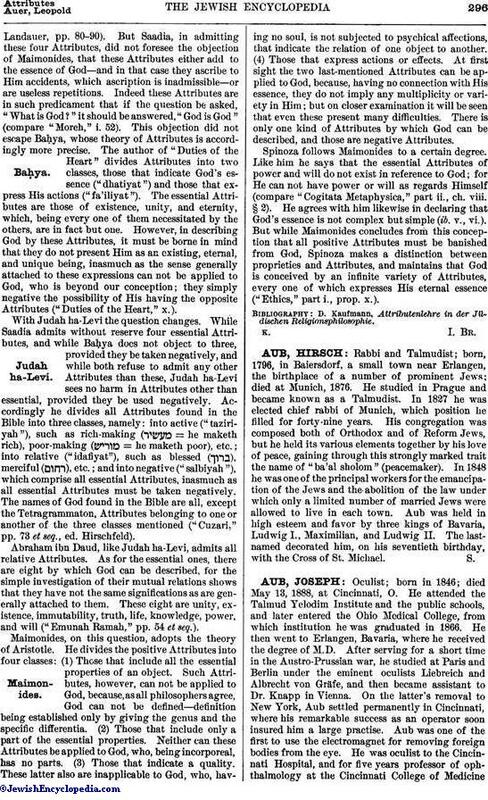 It is interesting, therefore, to inquire what attitude is assumed toward it by Judaism, with its fundamental and constant insistence on the unity of God, who possesses manifold spheres of work; with its many-sided forms of revelation; with its all-wise, all-good, all-powerful, all-animating God. Antithetically expressed, what is the relation of unity to multiplicity? Logically formulated, what is the relation of the individual to its species, of the species to its genus? Sociologically stated, what is the relation of human personality to the community, and of the community, on its part, to the state? It is evident from the preceding that the question of the Attributes of substance—be this substance God, Nature, Atom, Monad (ἔν καὶ πᾶν), Idea, Will, the Unknowable—concerns the very highest problems of human intellect; the question being intimately entwined with the fundamental problems, not only of scholastic, but of all philosophy, with the problem, indeed, of universals. It is therefore not surprising that in the Arabian-Jewish philosophy there should be a division between the defenders and the opponents of the doctrine of Attributes; or that within the field of attribute-conception the most minutiose attempts at adjustment are evolved, as was so ably shown in the pioneer literary production of David Kaufmann, "Attributenlehre in der Jüdischen Religionsphilosophie," Gotha, 1877. Though the problem of Attributes merited the most earnest consideration of the loftiest minds, the treatment it actually received was barren and unsatisfactory in the extreme. 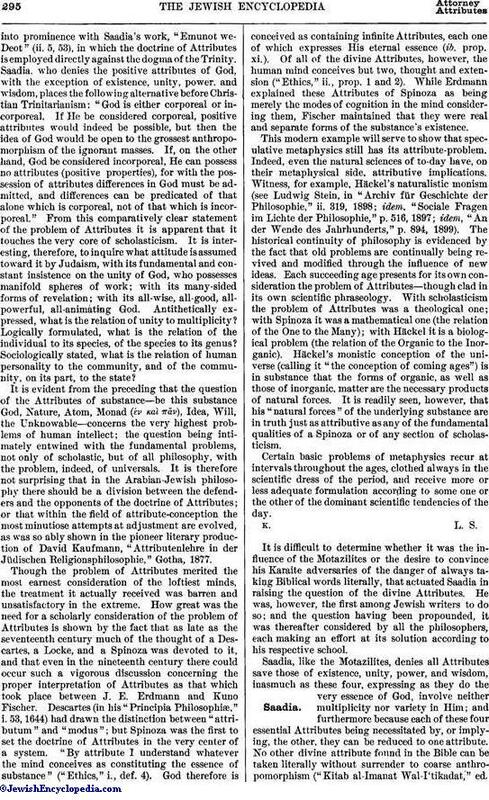 How great was the need for a scholarly consideration of the problem of Attributes is shown by the fact that as late as the seventeenth century much of the thought of a Descartes, a Locke, and a Spinoza was devoted to it, and that even in the nineteenth century there could occur such a vigorous discussion concerning the proper interpretation of Attributes as that which took place between J. E. Erdmann and Kuno Fischer. Descartes (in his "Principia Philosophiæ," i. 53, 1644) had drawn the distinction between "attributum" and "modus"; but Spinoza was the first to set the doctrine of Attributes in the very center of a system. "By attribute I understand whatever the mind conceives as constituting the essence of substance" ("Ethics," i., def. 4). God therefore is conceived as containing infinite Attributes, each one of which expresses His eternal essence (ib. prop. xi.). Of all of the divine Attributes, however, the human mind conceives but two, thought and extension ("Ethics," ii., prop. 1 and 2). While Erdmann explained these Attributes of Spinoza as being merely the modes of cognition in the mind considering them, Fischer maintained that they were real and separate forms of the substance's existence. This modern example will serve to show that speculative metaphysics still has its attribute-problem. Indeed, even the natural sciences of to-day have, on their metaphysical side, attributive implications. Witness, for example, Häckel's naturalistic monism (see Ludwig Stein, in "Archiv für Geschichte der Philosophie," ii. 319, 1898; idem, "Sociale Fragen im Lichte der Philosophie," p. 516, 1897; idem, "An der Wende des Jahrhunderts," p. 894, 1899). The historical continuity of philosophy is evidenced by the fact that old problems are continually being revived and modified through the influence of new ideas. Each succeeding age presents for its own consideration the problem of Attributes—though clad in its own scientific phraseology. With scholasticism the problem of Attributes was a theological one; with Spinoza it was a mathematical one (the relation of the One to the Many); with Häckel it is a biological problem (the relation of the Organic to the Inorganic). Häckel's monistic conception of the universe (calling it "the conception of coming ages") is in substance that the forms of organic, as well as those of inorganic, matter are the necessary products of natural forces. It is readily seen, however, that his "natural forces" of the underlying substance are in truth just as attributive as any of the fundamental qualities of a Spinoza or of any section of scholasticism. Certain basic problems of metaphysics recur at intervals throughout the ages, clothed always in the scientific dress of the period, and receive more or less adequate formulation according to some one or the other of the dominant scientific tendencies of the day. It is difficult to determine whether it was the influence of the Motazilites or the desire to convince his Karaite adversaries of the danger of always taking Biblical words literally, that actuated Saadia in raising the question of the divine Attributes. He was, however, the first among Jewish writers to do so; and the question having been propounded, it was thereafter considered by all the philosophers, each making an effort at its solution according to his respective school. Saadia, like the Motazilites, denies all Attributes save those of existence, unity, power, and wisdom, inasmuch as these four, expressing as they do the very essence of God, involve neither multiplicity nor variety in Him; and furthermore because each of these four essential Attributes being necessitated by, or implying, the other, they can be reduced to one attribute. No other divine attribute found in the Bible can be taken literally without surrender to coarse anthropomorphism ("Kitab al-Imanat Wal-I'tikadat," ed.Landauer, pp. 80-90). But Saadia, in admitting these four Attributes, did not foresee the objection of Maimonides, that these Attributes either add to the essence of God—and in that case they ascribe to Him accidents, which ascription is inadmissible—or are useless repetitions. Indeed these Attributes are in such predicament that if the question be asked, "What is God?" it should be answered, "God is God" (compare "Moreh," i. 52). 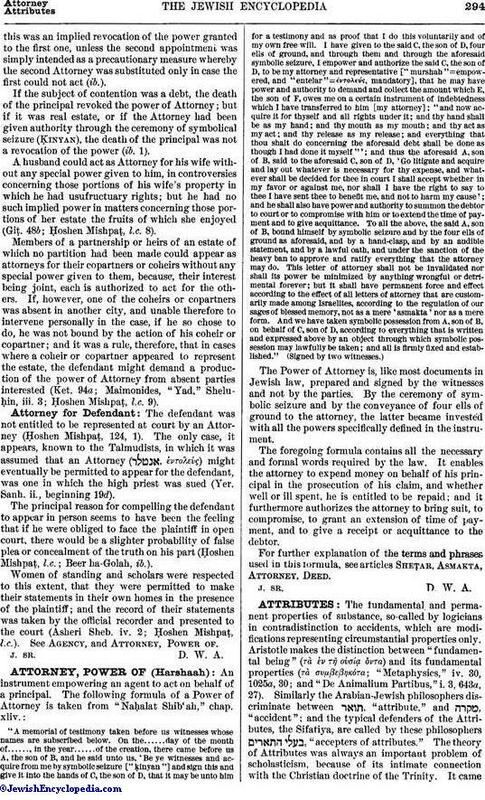 This objection did not escape Baḥya, whose theory of Attributes is accordingly more precise. The author of "Duties of the Heart" divides Attributes into two classes, those that indicate God's essence ("dhatiyat") and those that express His actions ("fa'iliyat"). The essential Attributes are those of existence, unity, and eternity, which, being every one of them necessitated by the others, are in fact but one. However, in describing God by these Attributes, it must be borne in mind that they do not present Him as an existing, eternal, and unique being, inasmuch as the sense generally attached to these expressions can not be applied to God, who is beyond our conception; they simply negative the possibility of His having the opposite Attributes ("Duties of the Heart," x.). With Judah ha-Levi the question changes. While Saadia admits without reserve four essential Attributes, and while Baḥya does not object to three, provided they be taken negatively, and while both refuse to admit any other Attributes than these, Judah ha-Levi sees no harm in Attributes other than essential, provided they be used negatively. Accordingly he divides all Attributes found in the Bible into three classes, namely: into active ("taziriyah"), such as rich-making ( = he maketh rich), poor-making ( = he maketh poor), etc. ; into relative ("idafiyat"), such as blessed ( ), merciful ( ), etc. ; and into negative ("salbiyah"), which comprise all essential Attributes, inasmuch as all essential Attributes must be taken negatively. The names of God found in the Bible are all, except the Tetragrammaton, Attributes belonging to one or another of the three classes mentioned ("Cuzari," pp. 73 et seq., ed. Hirschfeld). Abraham ibn Daud, like Judah ha-Levi, admits all relative Attributes. As for the essential ones, there are eight by which God can be described, for the simple investigation of their mutual relations shows that they have not the same significations as are generally attached to them. These eight are unity, existence, immutability, truth, life, knowledge, power, and will ("Emunah Ramah," pp. 54 et seq.). Maimonides, on this question, adopts the theory of Aristotle. He divides the positive Attributes into four classes: (1) Those that include all the essential properties of an object. Such Attributes, however, can not be applied to God, because, as all philosophers agree, God can not be defined—definition being established only by giving the genus and the specific differentia. (2) Those that include only a part of the essential properties. Neither can these Attributes be applied to God, who, being incorporeal, has no parts. (3) Those that indicate a quality. These latter also are inapplicable to God, who, having no soul, is not subjected to psychical affections, that indicate the relation of one object to another. (4) Those that express actions or effects. At first sight the two last-mentioned Attributes can be applied to God, because, having no connection with His essence, they do not imply any multiplicity or variety in Him; but on closer examination it will be seen that even these present many difficulties. There is only one kind of Attributes by which God can be described, and those are negative Attributes. Spinoza follows Maimonides to a certain degree. Like him he says that the essential Attributes of power and will do not exist in reference to God; for He can not have power or will as regards Himself (compare "Cogitata Metaphysica," part ii., ch. viii. § 2). He agrees with him likewise in declaring that God's essence is not complex but simple (ib. v., vi.). But while Maimonides concludes from this conception that all positive Attributes must be banished from God, Spinoza makes a distinction between proprieties and Attributes, and maintains that God is conceived by an infinite variety of Attributes, every one of which expresses His eternal essence ("Ethics," part i., prop. x.). D. Kaufmann, Attributenlehre in der Jüdischen Religionsphilosophie.